Macallan Gold: How much it changed from old 10 years old Sherry Oak? 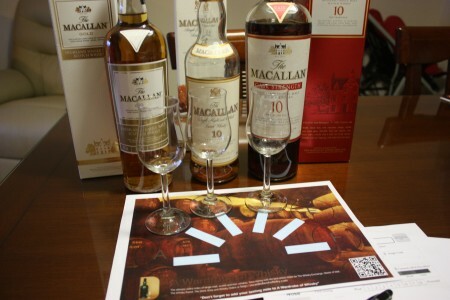 Home » Archive » Macallan Gold: How much it changed from old 10 years old Sherry Oak? Macallan has released a new range of non age statements to replace their Sherry and Fine Oaks whisky bottles from 10 years old to 18 years old. This new Macallan Gold is the initial entry on the new range of bottles, and it is already about £8 more expensive that the old Macallan 10 years old Sherry Oak. But the question is: Is it better? Well, I think that as Gold is a sherry cask aged whisky it is fair to compare it against Macallan 10 years old Sherry Oak and as I have the bottle around agains Macallan 10 years old Cask Strength. Macallan Gold was released in late 2012 as part of a series of colour-themed bottlings introduced to replace the distillery's age-statement expressions. This batch of Macallan Gold has been produced from 9-15yo first fill and refill sherry casks and is designed to sit between the now-defunct 10yo Sherry Oak and 10yo Fine Oak bottlings. Nose (89): more than average. honey, nuts, citrus, vanilla. Very nice aroma. Really does the work. It is slightly more subtle than 10 years old Sherry Oak. Palate (90): powerful, oily. nuts, honey, wood, citrus, spices, tobacco. Very nice whisky. 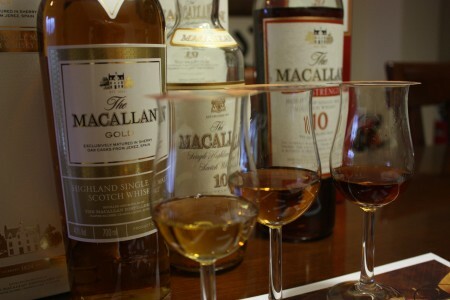 Definitively it is a nice Macallan to initiate yourself in the range. Finish (89): longer than average. nuts, honey, citrus. So based on other whiskies I have already tasted I rate this Macallan Gold with 89 points over 100. Nose (89): more than average. honey, floral, citrus, nuts, spices. Palate (90): powerful, oily. nuts, honey, citrus, spices, wood, cocoa. So based on other whiskies I have already tasted I rate this Macallan 10 year Sherry Oak with 90 points over 100. Nose (91): more than average. nuts, honey, citrus, wood, cinnamon. Marvelous! Palate (92): powerful, oily. nuts, honey, wood, citrus, cocoa, tobacco. The epitome of sherry aged drams. I love this profile. Finish (92): longer than average. nuts, honey, citrus. So based on other whiskies I have already tasted I rate this Macallan 10 year Sherry Oak Cask Strength with 92 points over 100. Well, I was expecting something more evil but the fact is that Macallan Gold is a very nice whisky, almost in the 90s rating. In the tasting profile, Gold is a whisky between the 10 years old Sherry Oak and 10 years old Fine Oak.